If I'm not mistaken, this downtown Minneapolis photo was taken at the Guthrie and it showcases a rather unique view of the downtown skyline with a haunting green hue cast on it. It's a great way to alter the typical "here's the skyline" shot. 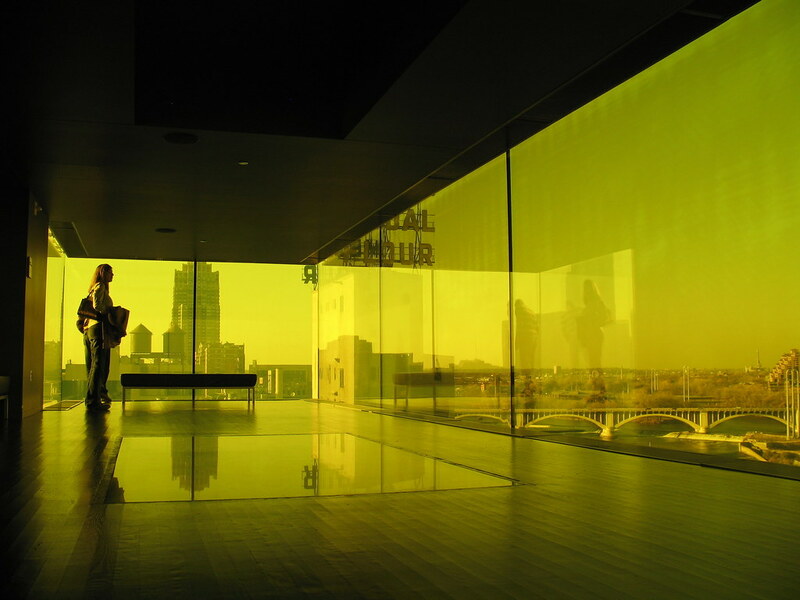 It's actually going yellow - This is the "Minnesota Room" that is open to the public a little further up in the Guthrie from the endless bridge. It was determined by the architect that using yellow tinting allowed one to gaze out into the brightly lit city for longer with less strain on the eyes, hence the amazing yellow glow that this room emits. The glass panel in the floor is also a window to below, since this part of the building is cantilivered similar to the the endless bridge itself. Awesome information. I'd love to check out the Guthrie as I've never been there in all my years in Minnesota.